This handmade beaded bookmark will help to keep your place until you have the time to get back to the book! A great way to add sparkle to your reading time.The perfect gift for book lovers! Red Glass Beads, White Glass Beads, Pink Cats Eye Glass Beads, Light Green and Clear Swarovski Crystals, Silver Toned Beads and Bead Caps. 11 1/2" Base, not including dangles. All items arrive Gift Boxed so you an keep for yourself or give to Someone Special as a Gift. Thanks for Looking and Happy Shopping. 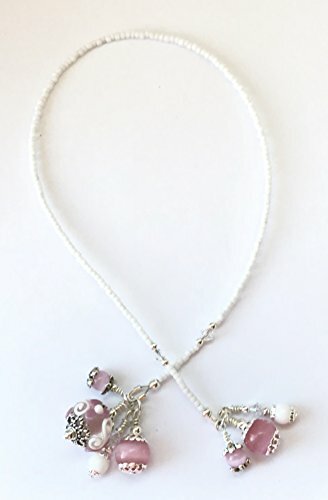 This Unique Handmade Beaded Bookmark Will Help To Keep Your Place in Your Favorite Book! A Great Way To Add Sparkle to Your Reading Time.The Perfect Gift for Book Lovers! Clear/Pink Lampwork Bead with a Pink and White Raised Flower Design, Pink Cats Eye Glass Beads, White Glass Beads, Clear Swarovski Crystals with an Iridescent Finish, Silver Toned Metal Beads and Bead Caps and White Seed Beads. 11 1/2" Base, Not Including Dangles, Fits Books Up To 10". Made on Strong and Durable Beading Wire. Crimp Covers Are Used For A Finished Look and Wire Guardians Are Used For Added Durability. All items arrive Gift Boxed so you an keep for yourself or give to Someone Special as a Gift. Thanks for Looking and Happy Shopping. 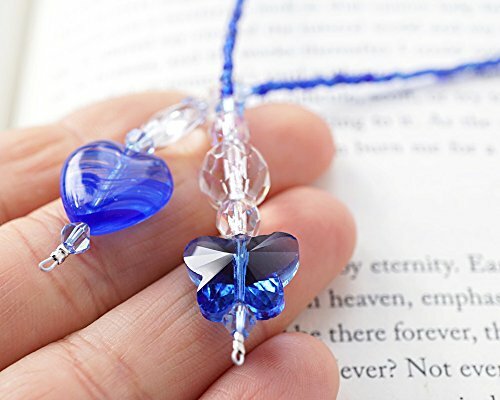 This handmade beaded bookmark will help to keep your place until you have the time to get back to the book! A great way to add sparkle to your reading time.The perfect gift for book lovers! 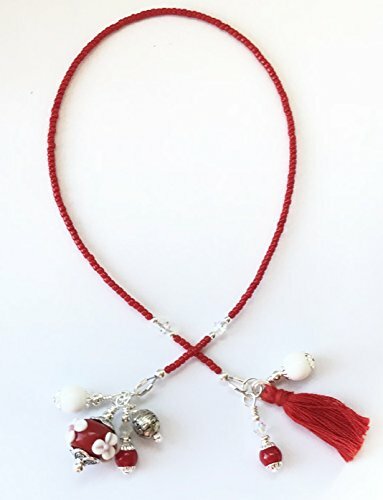 Red Lampwork Glass Beads with Raised White Flower Design,Red Glass Beads, White Glass Beads, Clear Swarovski Crystals with an Iridescent Finish, Silver Toned Beads and Bead Caps and a Dainty Red Tassel. 11 1/2" Base, not including dangles. All items arrive Gift Boxed so you an keep for yourself or give to Someone Special as a Gift. Thanks for Looking and Happy Shopping. 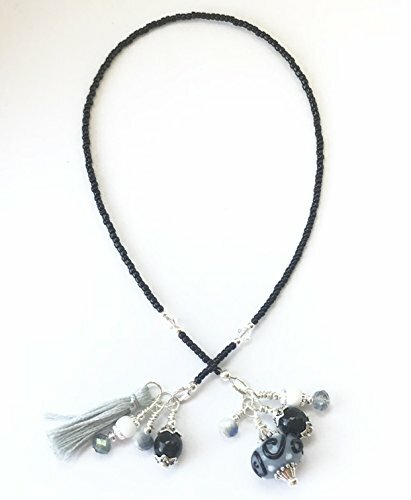 This Unique Handmade Beaded Bookmark Will Help To Keep Your Place in Your Favorite Book! A Great Way To Add Sparkle to Your Reading Time.The Perfect Gift for Book Lovers! Olive Green Lampwork Bead with a Swirl of Color and Raised Flower Design, Olive Green Glass Beads, Green Glass Beads, Olive Green Glass Pearls, Olive Green Swarovski Crystals, Gold Toned Metal Beads and Bead Caps and Olive Green Seed Beads With A Brushed, Metallic Finish. 11 1/2" Base, Not Including Dangles, Fits Books Up To 10". Made on Strong and Durable Beading Wire. Crimp Covers Are Used For A Finished Look and Wire Guardians Are Used For Added Durability. All items arrive Gift Boxed so you an keep for yourself or give to Someone Special as a Gift. Thanks for Looking and Happy Shopping. This handmade beaded bookmark will help to keep your place until you have the time to get back to the book! A great way to add sparkle to your reading time.The perfect gift for book lovers! Blue/Grey Lampwork Glass Beads with Raised Black Swirl Design and White Dots , Black Glass Beads, White Glass Beads, Faceted Grey Glass Beads, Black Seed Beads, Clear Swarovski Crystals with an Iridescent Finish, Silver Toned Beads and Bead Caps and a Dainty Grey Tassel. 11 1/2" Base, not including dangles. All items arrive Gift Boxed so you an keep for yourself or give to Someone Special as a Gift. Thanks for Looking and Happy Shopping. 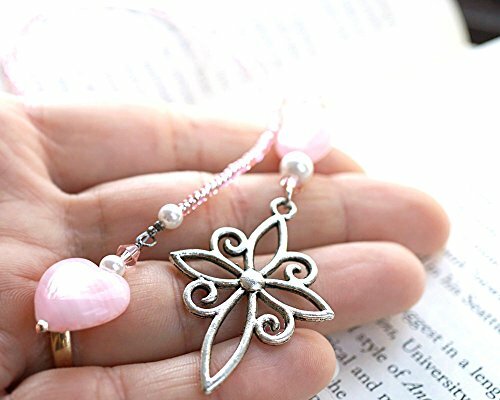 This Unique Handmade Beaded Bookmark Will Help To Keep Your Place in Your Favorite Book! A Great Way To Add Sparkle to Your Reading Time.The Perfect Gift for Book Lovers! 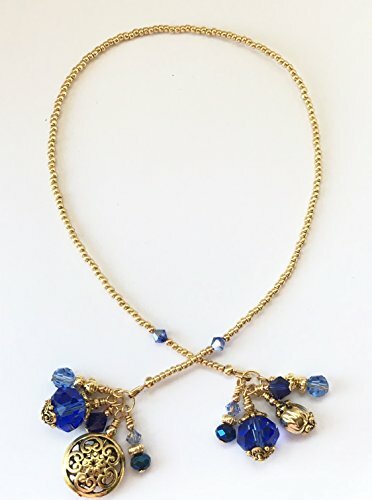 Gold Toned Metal Focal Bead with a Flower Design, Dark Blue Faceted Glass Beads, Light Blue Faceted Glass Beads, Dark Blue Swarovski Crystals, Gold Toned Metal Beads and Bead Caps and Gold Colored Seed Beads With A Brushed, Metallic Finish. 11 1/2" Base, Not Including Dangles, Fits Books Up To 10". Made on Strong and Durable Beading Wire. Crimp Covers Are Used For A Finished Look and Wire Guardians Are Used For Added Durability. All items arrive Gift Boxed so you an keep for yourself or give to Someone Special as a Gift. Thanks for Looking and Happy Shopping. 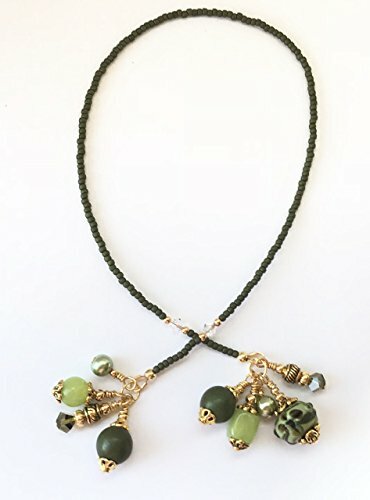 Looking for more Beaded Lampwork Swarovski Bookmark similar ideas? Try to explore these searches: Fruit Flavored Chewing Gum, Fall Abundance Wreath, and Big Sister Tee Shirts. Look at latest related video about Beaded Lampwork Swarovski Bookmark. Shopwizion.com is the smartest way for online shopping: compare prices of leading online shops for best deals around the web. 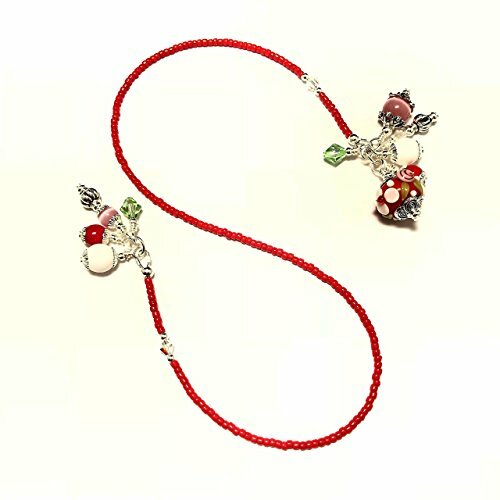 Don't miss TOP Beaded Lampwork Swarovski Bookmark deals, updated daily.